Powell Gardens features three structures designed by renowned American architect E. Fay Jones. Jones is one of the best-known disciples of Frank Lloyd Wright and carried on Wright’s Prairie Style and principles of organic design. An Arkansas native, Jones was commissioned to design the public buildings at Powell Gardens so they would have a timeless quality. Jones forged a reputation for mastering the integration of architecture with nature and limited his work to a few building types—more than 200 houses and a handful of pavilions and chapels. In 2000, Jones’ Thorncrown Chapel in Eureka Springs, Ark., was voted one of the most important buildings of the 20th century by the American Institute of Architects. At Powell Gardens the work of Jones and his partner Maurice Jennings, who joined Jones’ firm in 1972, uses natural materials, wide expanses of glass that bring the outside in and lines that allow each building to blend into its surroundings. Designed by Maurice Jennings and built by Powell Gardens’ facilities staff, this building opened in May 2002. Its 25-foot-long gates weigh 7,500 pounds each but are counterbalanced so well they can be lifted with one hand. 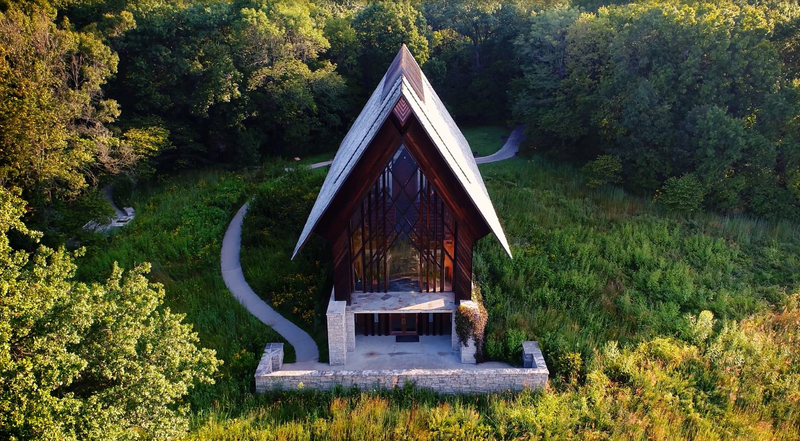 Opened in 1996, this nondenominational chapel features doors that stretch 13 feet high and 2,550 square feet of glass, allowing the building to blend with the surrounding prairie. It is 47 feet high, 102 feet long and seats up to 120 people. The building is named for Marjorie Powell Allen, who often rested under a tree nearby. The outdoor lighting, fountain and flagstone courtyard, plus seats, sconces, candle holders and lecterns all were designed by the architects. Opened in February 1997, this 18,000-square-foot building is built of redwood, limestone and glass and includes a 30-foot-tall conservatory. The building and all its furnishings including the benches were designed by Jones and Jennings. Dedicated in 1995, this redwood multi-tiered trellis sits at the centrifugal point of Powell Gardens. 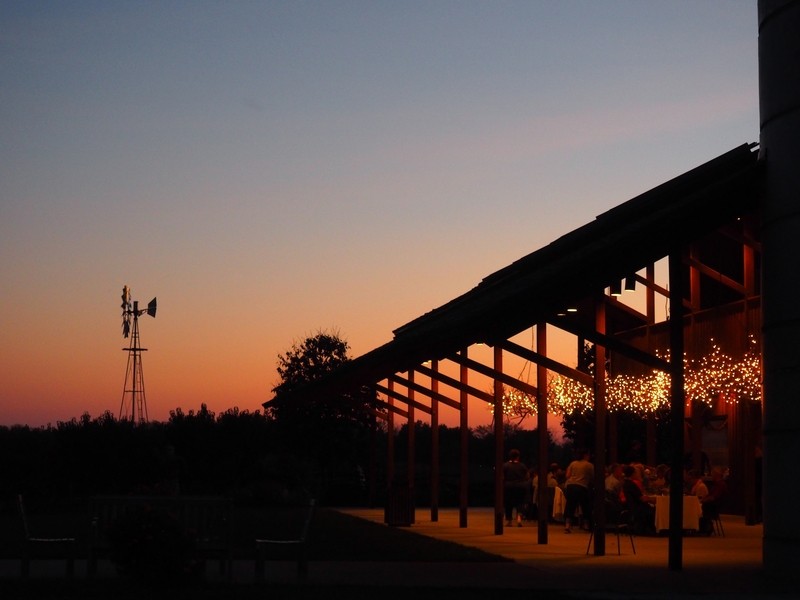 It lines up perfectly with the middle of the Visitor Center and is a great place to enjoy a sweeping view of the Gardens and surrounding countryside. Designed by Maurice Jennings Architects, this contemporary open-sided barn is made from cedar with a natural stain for preservation. 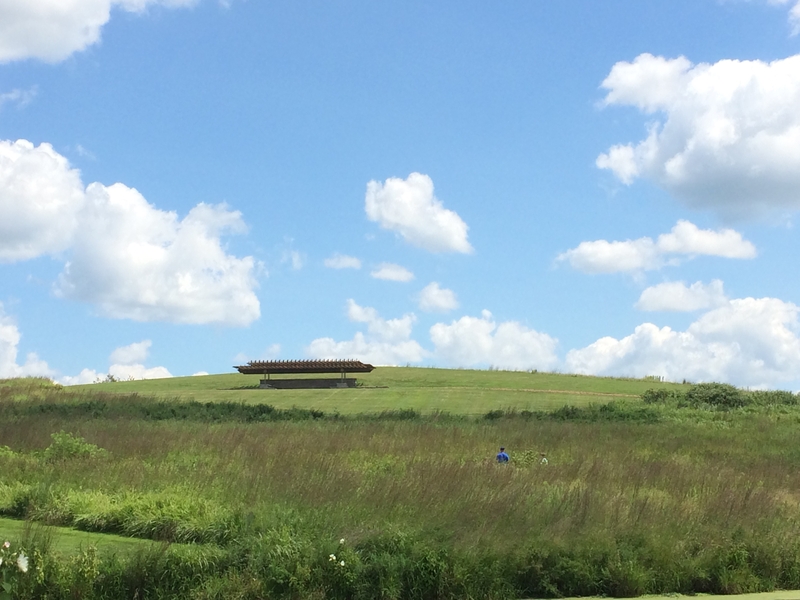 The attached 45-foot silo is patterned after traditional Missouri barn silos and provides an observation deck for viewing the Quilt Gardens below. It opened in 2009.